The attic–that strange and often forgotten space, where dust accumulates with years of neglect and boxes of items that have ceased to serve their daily functions lie dormant. Perhaps due to that strange remove from daily life or the general role served as the keepsake of forgotten objects and distant memories, the attic has become a ripe space for the imagination, embroiled in everything from lighthearted fantasy to abject terror. It’s within the attic that we lose control as the logic and intentions of the space make themselves known to those seeking, or those who simply stumble upon the space, and it’s within this context that Maria Guzmán Capron’s latest exhibition takes shape. 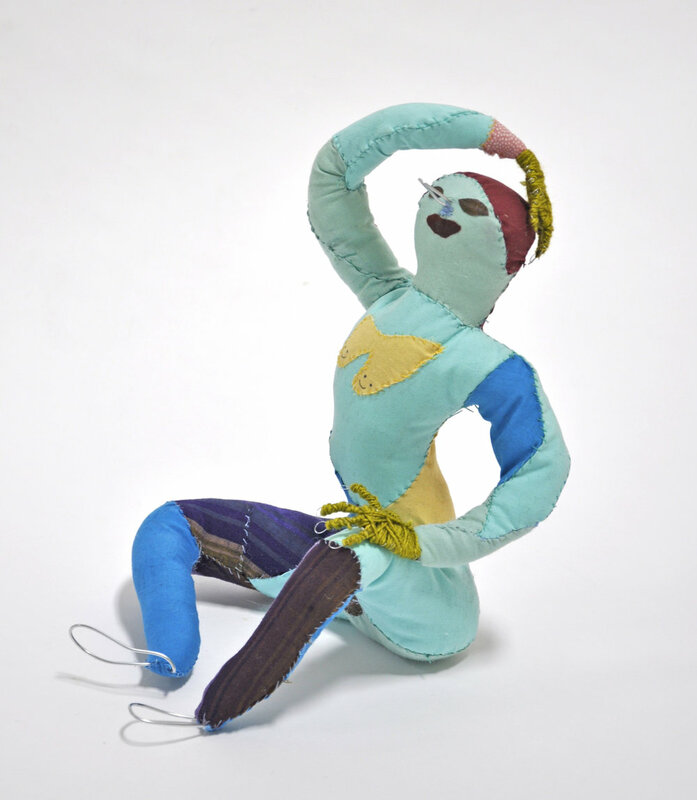 In the refuge of the attic, Capron’s figures can stretch their limbs, fully at peace to luxuriate in their own obscurity becoming static once again as an intrepid viewer climbs the stairs to the gallery’s upstairs space. 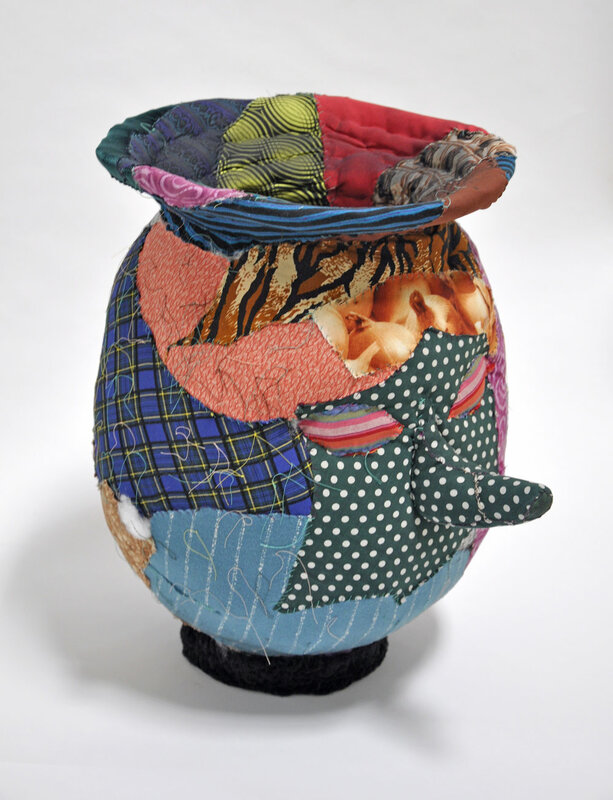 Much like the clumsy array of furniture strewn about the attic, the artist’s highly idiosyncratic figures, realized in textile, wood, painted embellishment and various other materials lovingly embrace the language of contrast and difference. They’re difficult, defiant and deeply individualistic, exuding personality yet briskly reminding the casual viewer that they are the ones who reign over the attic space and not the other way around. Some grace the walls while others sit atop and within the various pieces of discarded furniture that have found their way up to this forgotten place, a place that has long since lost control to the whims of its new inhabitants. Maria Guzmán Capron has exhibited across the United States, including recent exhibitions at the Visual Art Center of Richmond (Richmond, VA); No Place Gallery (Columbus, OH); Able Baker Contemporary (Portland, ME); and BBQLA (Los Angeles, CA). In San Francisco, Capron’s work has shown at Alter Space, 100% gallery, Minnesota Street Project, and R/SF projects, as well as in Oakland at Interface Gallery and City Limits. Guzmán Capron was the recipient of the Graduate Painting Fellowship at California College of the Arts (San Francisco, CA), was Artist in Residence at Diverseworks (Houston, TX). She was born in Milan, Italy in 1981 to Peruvian and Colombian parents, and lives and works in Oakland, CA.